One of the huge NM wildfires from last year: The Los Conchas Wildfire above from USA Today. To see all the NM wildfires which happened just last year 2011 see this link. Congressman Ben Ray Luján of New Mexico’s Third District introduced legislation to help protect national forests from wildfires while creating jobs in local communities. The Forest Stewardship and Fire Fuels Reduction Act of 2012 is a 10-year reauthorization of a federal program that funds efforts to reduce overgrown vegetation in forests that contributes to the intensity and devastation of wildfires. The bipartisan bill is cosponsored by Congressman Paul Gosar of Arizona. Currently, the United States Forest Service (USFS) and the Bureau of Land Management (BLM) are authorized to enter into Stewardship End Result Contracting Projects to improve land management and remove these hazardous organic fuel materials from our national forests. USFS and BLM have used Stewardship End Result Contracting Projects over the last 10 years to reduce the hazard of overgrown vegetation in national forests, however, the authorization for this contracting process is scheduled to end in 2013. The loss of these agreements will limit the ability of the USFS and BLM to carry out fuels reduction and thinning projects in national forests, resulting in increased fire danger and the loss of jobs in the local economies. Luján introduced similar legislation last year to provide a permanent reauthorization of the contracting process. After working with the Natural Resources Committee and his Republican colleagues, Luján is introducing an updated version with a 10-year reauthorization that has earned bipartisan support. Stewardship End Result Contracting promotes sustainable natural resource management practices in a broad range of activities that improve land conditions including fire fuels reduction and forest thinning projects to help protect forests from wildfires. As an added benefit to local communities, stewardship contracting encourages a closer working relationship between rural communities and federal agencies by promoting economic development through contract opportunities. I grew up in Los Alamos and spend a lot of time there now, taking care of my mother. I was meaning to write about the big fires then (2000) and now (2011). There are some interesting contrasts between the events. But I simply don’t have the time to spend on it. Nevertheless, there is a story that I wish someone with the resources and skills could write. Basic facts about the 2011 fire: it was the largest fire in the history of the state of New Mexico, and for the first day it consumed one acre every 76 seconds. A fire moving that fast across the landscape does not consume everything, until it reaches a canyon, at which point it is sufficiently contained that it does burn, baby. It burns. Frijoles Canyon in Bandelier National Monument is such a place. In 2011, it burned. Fire is always a bit capricious, and there are some areas in that canyon that managed to escape the conflagration. One such area happened to contain a farm with 9200 pot plants, 10 feet tall, essentially ready to harvest. The official estimate of the value of the crop (easily disputable, but let’s take them at their word) is $9.2 million. It has been reported that the farmers fought the fire; they burned a perimeter around the crop to protect it. If they had done this burn anytime before the fire was rapidly advancing, they would have been discovered, and they were not. This was a huge, fast-moving fire. They were absolutely brave in protecting that crop. The crop was saved, the farmers survived. The farm was discovered by overhead surveillance after the fire, partly because there was some kind of a tarp visible amidst the green island where unburned forest also remained as before, visually protecting the crop. The area stood out because of the absolute black -- “like black paint” -- covering every surrounding surface, as one person described it to me. This is the first time that a pot farm has been discovered in a National Forest in New Mexico. It was a large off-grid enterprise with few employees. That is a very big cash crop, even by half. It may not be the first year that the area was farmed. I am sure they are now reexamining past satellite footage. I have talked to a variety of people about this story, and I am sure it would be compelling if someone could devote more time to it. When the National Lab was no longer “at risk,” the national media went away. But there is a story here. Just say Now. This is a guest blog by Barbara Grothus. If you'd like to submit a piece for consideration as a guest blog, contact me by clicking on the Email Me link at the upper left-hand corner of the blog. In response to the evacuation of Los Alamos, the Santa Fe Food Depot has begun preparing for food response to evacuees of the Las Conchas Fire. The Santa Fe has asked Roadrunner Food Bank to help in its support of the efforts. The Santa Fe Reporter that the Conchas Fire in Northern New Mexico has now grown to 60,000 acres in two days and counting. So far, it is zero percent contained. Yesterday, a mandatory evacuation of the town of Los Alamos was ordered, and that evacuation proceeded in an orderly fashion with some traffic backups. 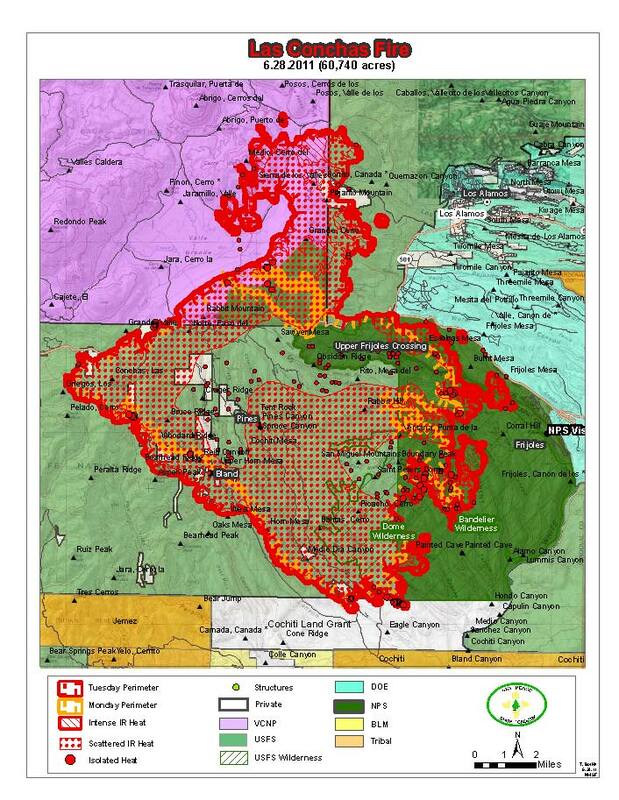 Here's a link to the latest map of the fire based on an infrared flight last night. Here's a list of shelters, pet shelters, hotels that are offering reduced rates for evacuees and other helpful webites. Frequently updated info is available on the website http://nmfireinfo.wordpress.com/, which reports today that no fires burned on Lab property overnight, that all nuclear and hazardous materials, including those at the Lab’s principal waste storage site known as Area G, are accounted for and protected, and that LANL monitoring teams detected no releases of radiological or other contaminants. That's the official word, anyway. It's been confirmed that EPA/DOE radiation air monitoring crews were sent in last night to monitor the Las Conchas fire. KSFR's 101.1 tower was knocked out when the fire covered Pajarito Mountain in Los Alamos. The Santa Fe Public Radio station is still streaming info about the fire at ksfr.org/. The Northern New Mexico Central Labor Council -- serving Santa Fe, Los Alamos, Rio Arriba, Taos, San Miguel, Mora, and Colfax Counties -- issued a statement saying it's joining with area labor and community organizations In asking the community of greater Santa Fe to assist Los Alamos residents who have had to evacuate their homes and move to shelters or seek help from friends and family. Food and other items are needed. Area labor unions and other socially active organizations are being asked to donate money to help purchase some of these items -- or to go out and buy $100-200 worth of these items and deliver them to The Food Depot. Items should be delivered Tuesday afternoon (1:00 PM to 4:00 PM, or on Wednesday morning 9:00 AM to 12:00 Noon, and Wednesday afternoon from 1:00 PM to 4:00 PM, and Thursday if necessary). Thanks to all who can lend a hand. Please pass this information to your friends, neighbors and colleagues. Click for a flyer (pdf) that can be downloaded and copied. Santa Fe New Mexican resource page for Conchas fire. Photo credit: Los Alamos National Laboratory Flickr account.